Succeeded by the Buck Plating Co.
Brothers John S. and Edward Bromley. in 1874. Went out of business in Jan., 1886. 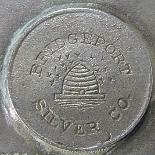 A trade name of International Silver. name were described as "half plate". See flatware patterns. works and clocks. Acquired Holmes & Tuttle in 1857. Co. Late 1890s Holmes & Tuttle patterns sometimes carry the Bristol Brass & Clock Co. backstamp. East Haddam, CT 1864-1905 See flatware patterns. they now exclusively produce knives. of International Silver in 1898. See flatware patterns. 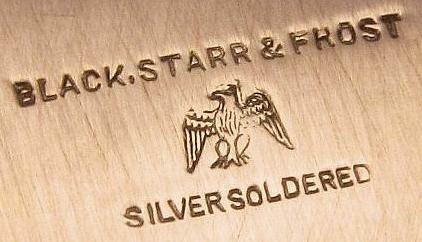 A trademark of International Silver. See flatware patterns. A trade name of the Pairpoint Mfg. Co.
W. & S. Blackinton Co.
Silver in 1898. See flatware patterns. A line of goods manufactured by the Standard Silver Plate Co. for the T. Eaton Co.
A trade name of the Van Bergh Silver Plate Co.